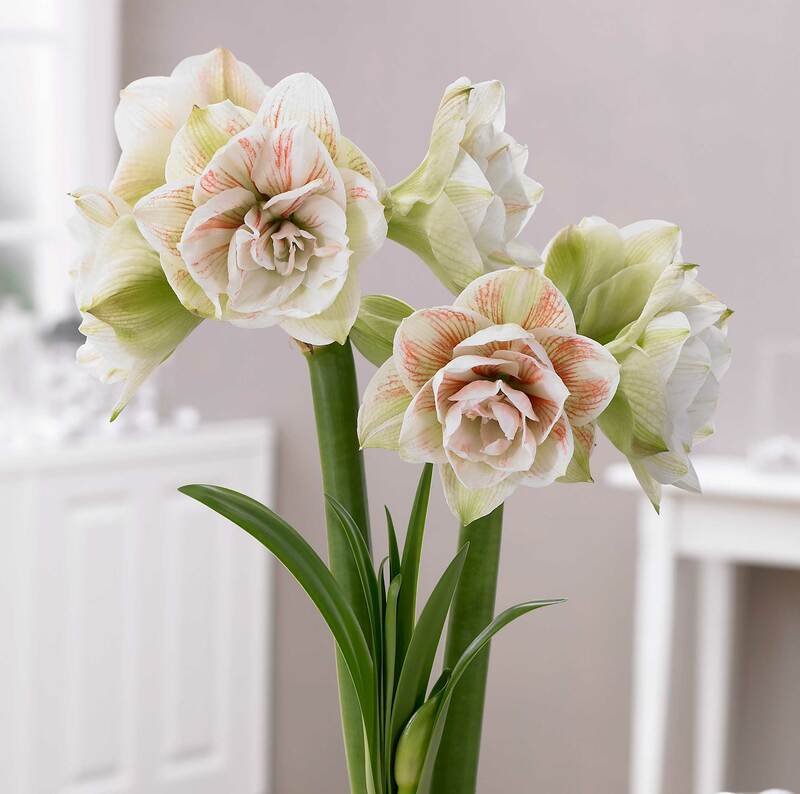 For me, amaryllis are a necessity. I always feel a bit lost during the winter when I can’t be in my garden. Planting amaryllis bulbs and watching them grow is both comforting and satisfying. It’s just enough like gardening to keep me sane while I’m waiting to get my hands back in the soil. 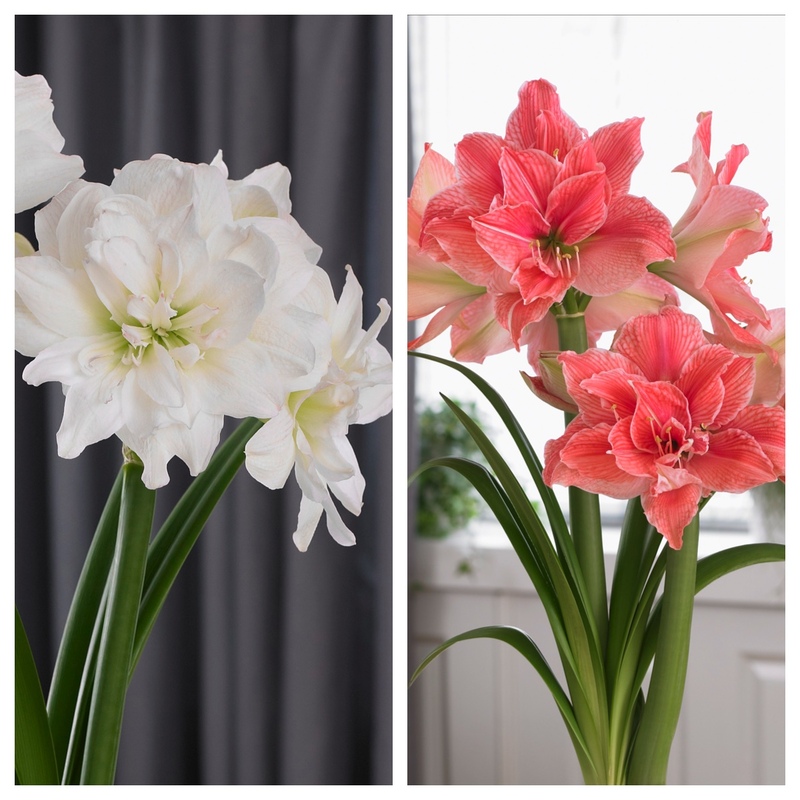 Amaryllis have always been impressive, but today there are some truly fabulous varieties to choose from. 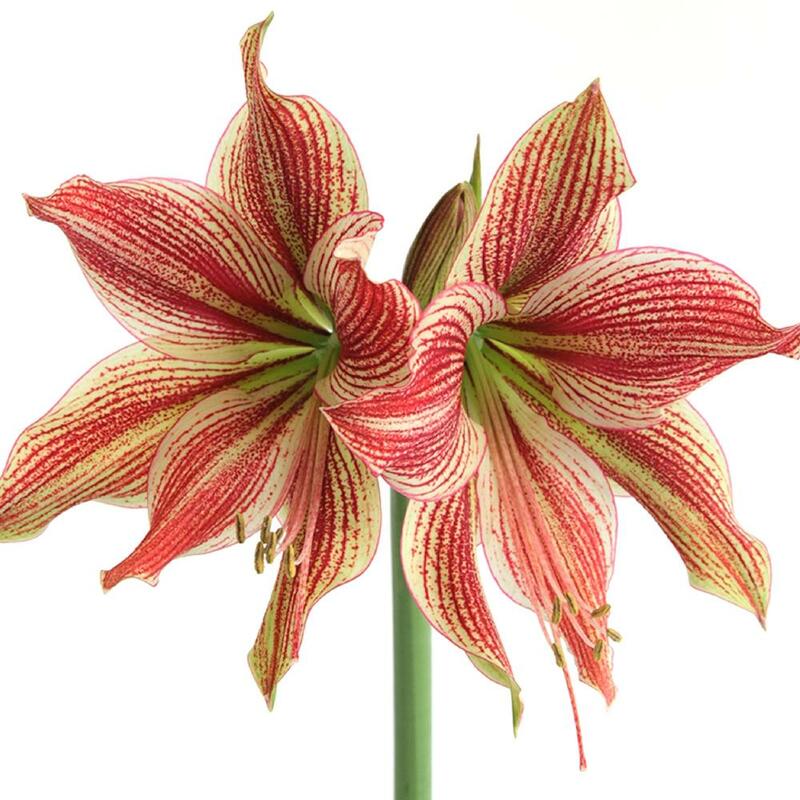 If it’s been a while since you have grown amaryllis, or, if you tend to stick with traditional reds and pinks, read on to see some irresistible options for the coming season. Clockwise from upper left: Splash, Spartacus, Amorice. All three of the varieties shown above, have bright white petals and distinctive red markings. They are far more elegant than you’d expect from flowers described as being “striped.” Need a mid-winter display of nature’s artistry? These varieties are just the thing. I usually start the winter with 6-8 amaryllis bulbs. I plant two in early November, two in early December and the rest in early January. This gives me plants at all different stages and I can usually count on a full three months of flowers. Extra petals aren’t always a good thing. Sometimes plant breeders modify flowers in ways that obscure their natural beauty. 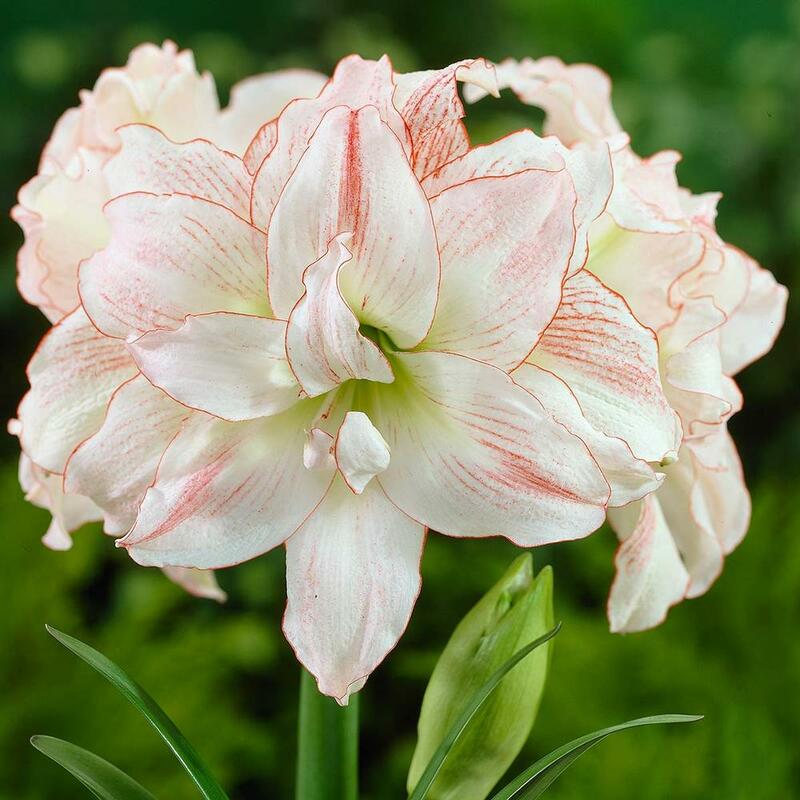 But I think extra petals give amaryllis flowers a soft and romantic quality. This year I am growing two doubles: Nymph and Aphrodite. A couple years ago, I started cutting my amaryllis and displaying the flowers in vases rather than in pots. By the time the flowers are in bloom, they are often top heavy and it can be hard to keep the pots upright. It’s also challenging to find a place to display such a tall flower. Cutting the flowers down to a height of 12-18″ makes it much easier to display them in a vase on my dining room table, where they can get all the attention they deserve. The variety Exotica was one of my all time favorites. This year it’s been replaced by Terra Cotta Star, which has the same dusky salmon flowers and intricate markings that remind me of butterfly wings. 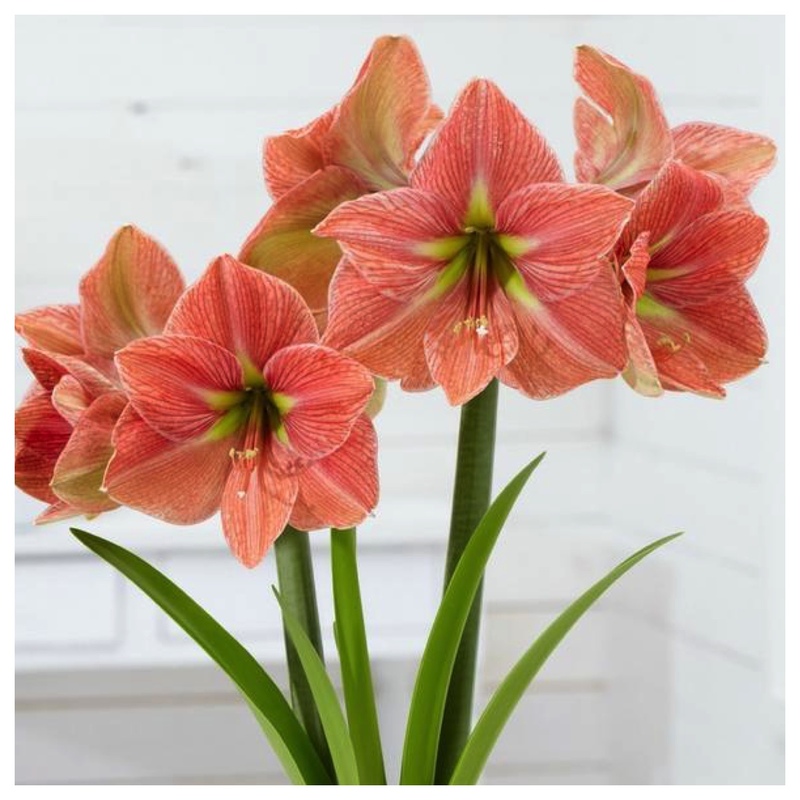 If you have a weakness for coral and peach, you’ll adore this amaryllis. I’ve been trying to photograph Lagoon for a couple years now, and can’t seem to capture its unique color. This photo is pretty accurate, but in person it’s not quite this pink. I’d describe the color as rose-coral with a hint of blue. The flowers are enormous, with broad and flattened faces and glittering golden stamens. Magic Green is another variety that’s very difficult to capture in a photograph. It’s probably one of those flowers that you either love or hate. For me, it’s definitely love. The blossoms are not as large as most others, but they are exquisite. 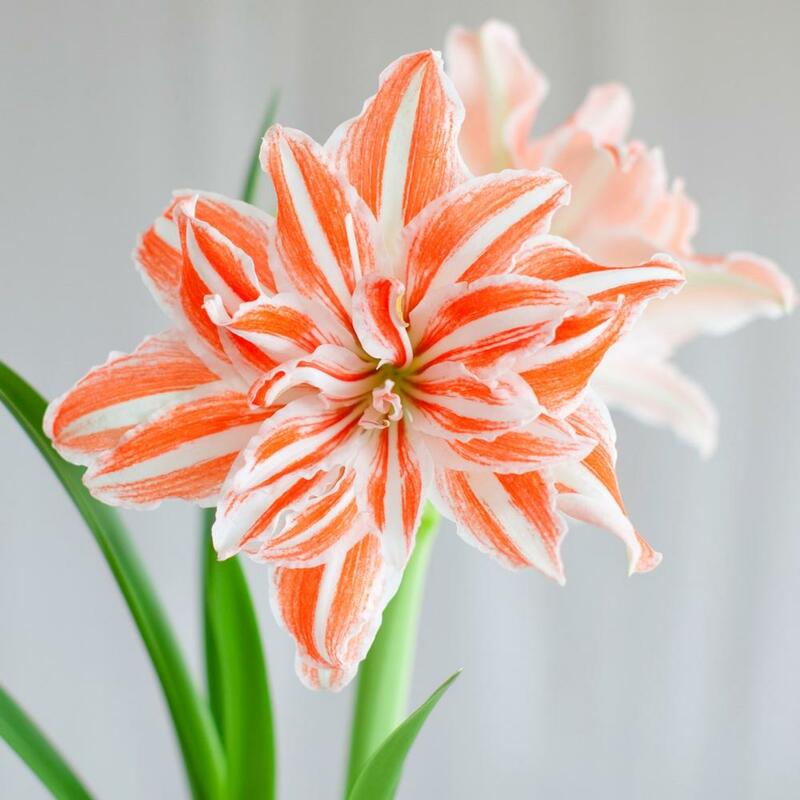 Want to learn more about these amazing indoor bulbs? 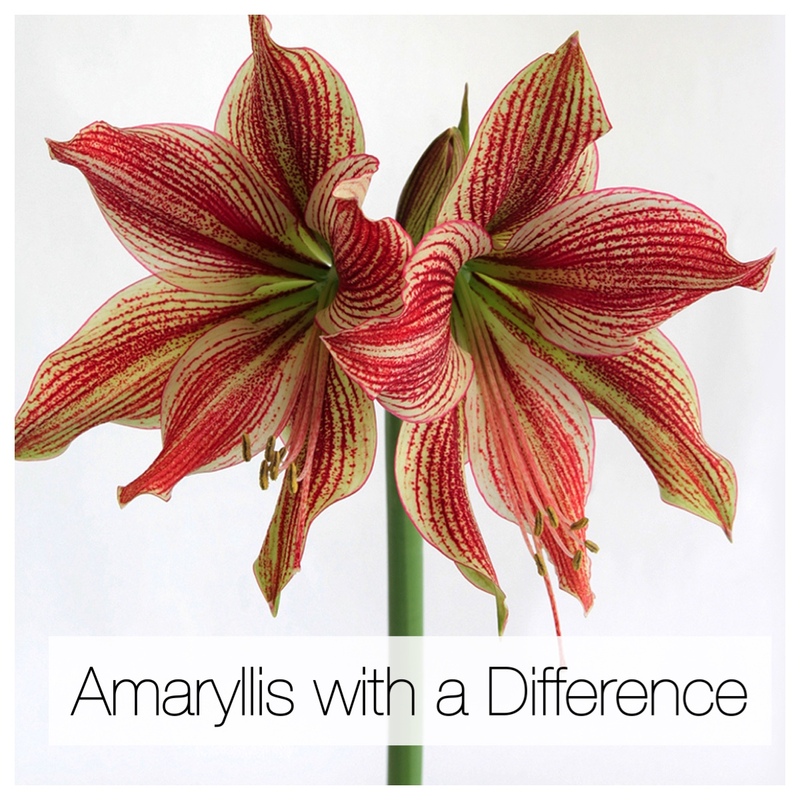 Read How to Choose a Quality Amaryllis Bulb. Ready to shop for some bulbs to get you through the winter? You’ll find our complete selection HERE. amount of wonderful flowers in your home during the Vermont winters..amazing.. I would love to know how to grow these specimens in my home.. Thank you for the truly great photographs…I copied them all to my ‘flowers’ folder..
Hi Michael. It’s true that amaryllis are incredibly easy to grow. Just buy some bulbs, put them in pots and watch them grow. 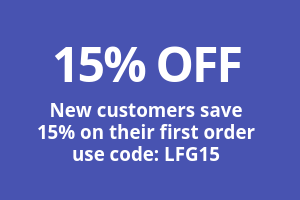 Order a few bulbs and try it yourself! 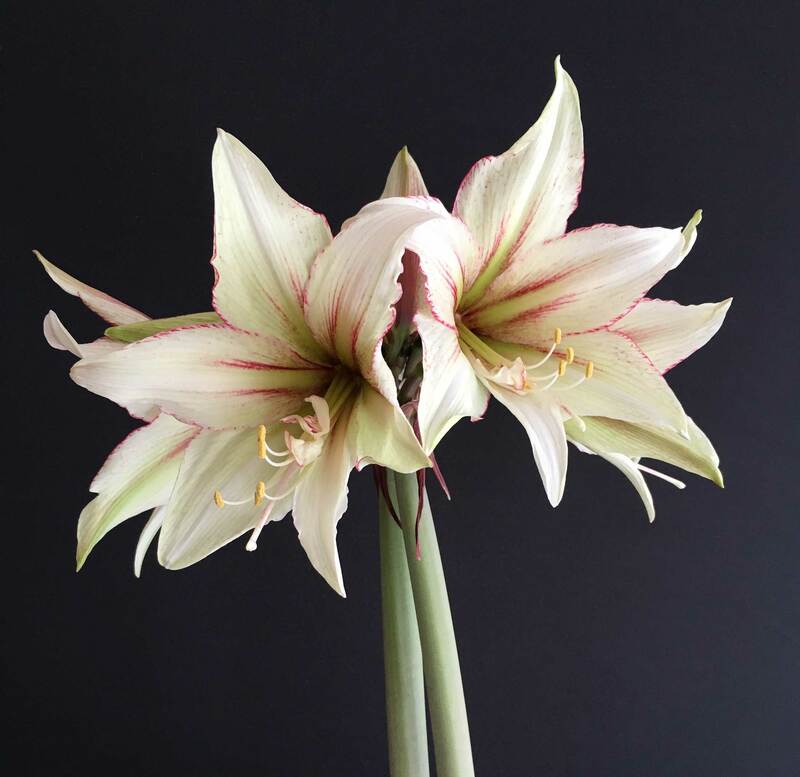 You can find more information about growing amaryllis on our website: http://www.longfield-gardens.com In the navigation bar, click on LEARN and then you’ll see a number of articles under “winter-indoor”. Enjoy! I just left an email on Longfield website. Oh my!! What great bulbs. I finished potting them this afternoon to give as gifts tomorrow. This makes me smile ?. I look forward to the ones for next year. Hi Diane — What great gifts! I hope you kept a couple bulbs for yourself to enjoy? 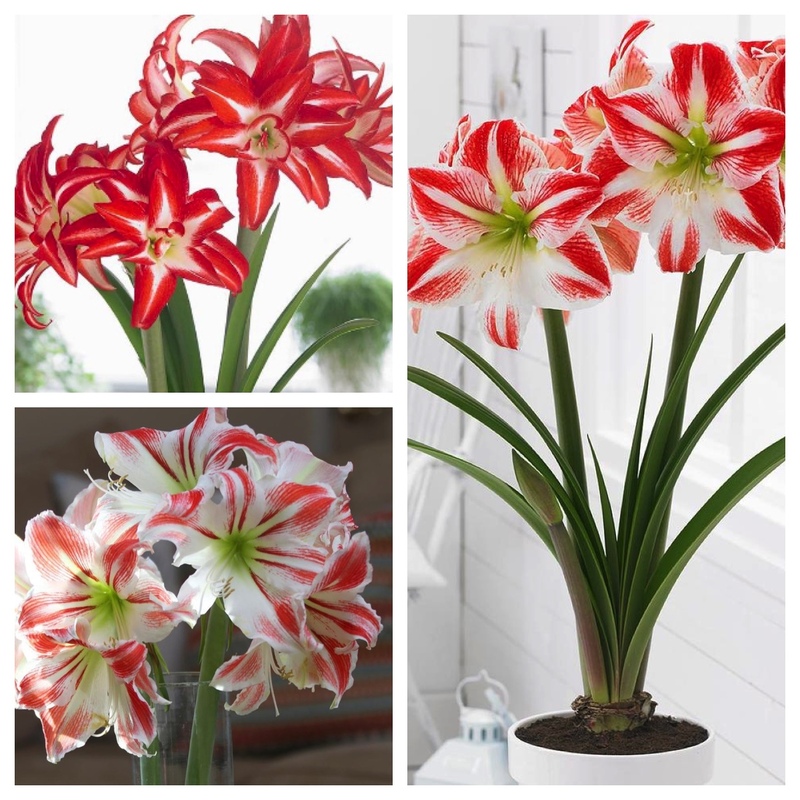 We usually have amaryllis bulbs available right through December. Good morning. I’m in Washington D.C. and these are beautiful. I’m looking for flowers thday go well in the winter and our into the spring/ summer. I’m a beginner landscaper/ hardscaper, and i need ideas for clients in order to continue into the winter and spring month’s. Any suggestions? Hi Naadir, Amaryllis are great for indoor flowers. 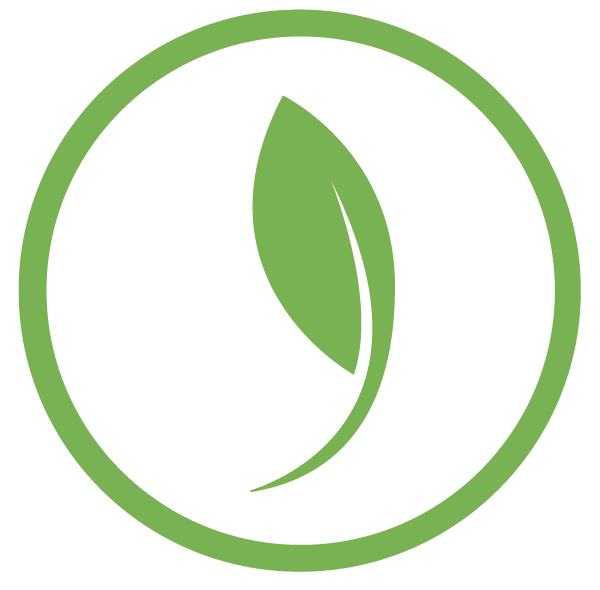 They will not survive the winter outdoors except in frost-free climates. Fall-planted bulbs that bloom in spring (tulips, daffodils, hyacinths) and spring-planted bulbs that bloom in the summer (dahlias, lilies, cannas, callas) are colorful, trouble-free plants. You can learn more about all of these bulbs on our website: longfield-gardens.com Just look on the LEARN tab in the navigation bar. Do you have to wait for all buds to open before cutting to transfer to a vase? I had to add counter weight to pot as it was falling over. Hi Patricia – As long as the first buds are soft and close to opening, the smaller buds should still open for you. Wow! Lucky you. 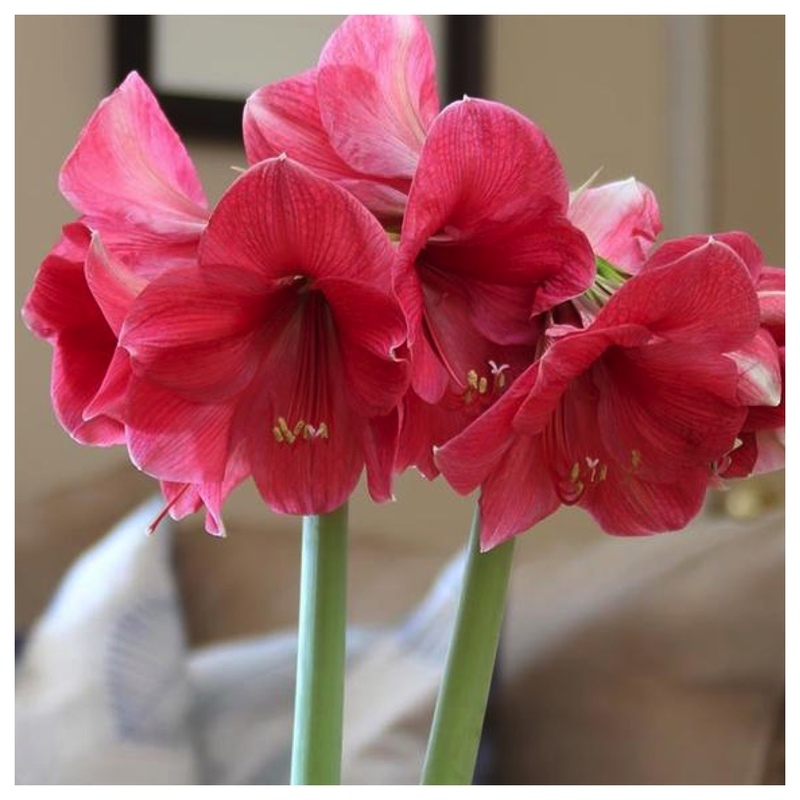 Must be fun to have amaryllis in your flower garden! Do I have to dry the bulbs after finished blooming an before growing them the next year? Or can I leave them in the pot to keep growing?